Convert DVD to iRiver PMP AVI? Try out 4Media DVD to MP4 Converter. 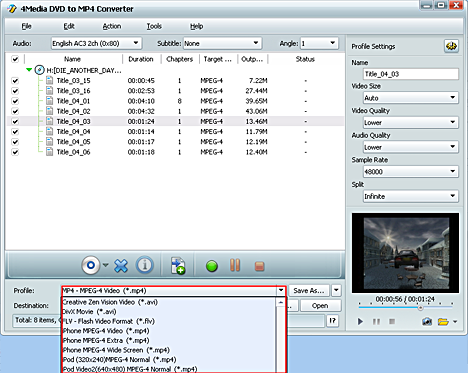 Not only convert DVD to MP4, it can also convert DVDs to AVI format compatible with iRiver PMP and Archos. Let's see how to convert DVD to iRiver PMP using 4Media DVD to MP4 converter. 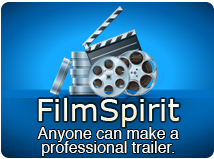 Firstly, you need to download here DVD to MP4 Converter and it's free to try. Then install it on your computer and launch the software. Ok, here we go. Insert the DVD disk into the DVD-ROM, and click the "Add" button to load it. And the DVD content will list in the software window.. Selecting output format is really easy: Open the "Profile" drop-down list and scroll to select the format. Just choose the iRiver PMP-100 Video (*.avi ) in the list. It's ready for iRiver PMP player. 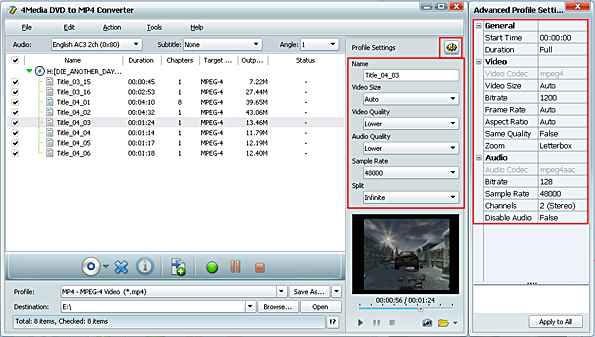 If you are a veteran user, you could change the default DVD audio, subtitle, and angle, Zoom mode for output format. And to further customize the videos by setting output video size, video quality, and channels in Advanced profile setting panel. After setting your own output and settings you can click “Start” button to start your conversion. When the "completed" status shows and the conversion finished, you can just click the "open" button to check the converted videos. Put them on your iRiver and watch the DVD movie everywhere. Free download 4Media DVD to MP4 Converter to taste the joy!